LightHeart Gear is a new web site that I just came across. 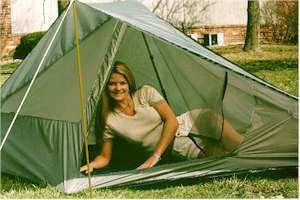 They manufacture and sell two new ultra-light tents that look very nice in their photos. The tents are hybrid single/double wall tents with bathtub floors and full mosquito netting. The solo is 1#10 oz. ($235.00) and the duo is 2# ($295.00). This is a nice looking web site with a lot of links to other hiking and backpacking sites. Yeah, we've been discussing this company lately. It doesn't sound like many people here have used or even seen these tents, although one of the members here has interviewed the lady behind Lightheart. If I hadn't gone for the Hexamid, the Lightheart is a shelter I would have seriously considered. 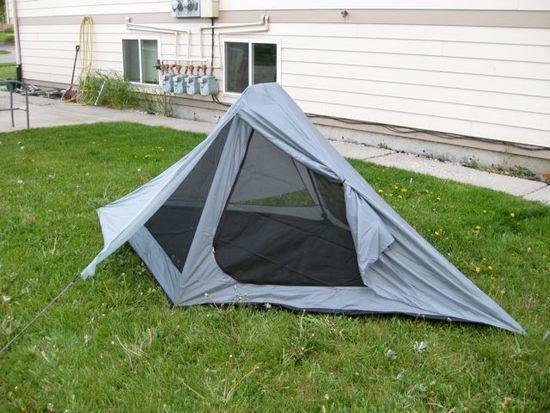 I think it would be a great lightweight shelter that provides excellent visibility on mosquito-laded rainfree nights. It's very similar to the Wanderlust. I had my hands on a Lightheart for a couple days and set it up in my yard. Very fine crafts[wom]manship and some unique bits to set it apart from it's competitors. Is the shelter quality/usefulness on par with the likes of Tarptent, Six Moon, MLD? That's a broad question as each of those manufactures is of varying quality. I've personally never had my hands on a shelter from MLD or Six Moon Designs so can't comment on them. I do own a Tarptent however and would rate the craftsmanship of both Tarptent and Lightheart as being top notch. I did not field test the Lightheart however so can't comment on performance in any way. ** edit – I take that back, I have handled three MLD shelters last summer now that I think of it and would rate Ron's abilities very highly for quality. Once again, no field testing knowledge though. – They are very similar weights. 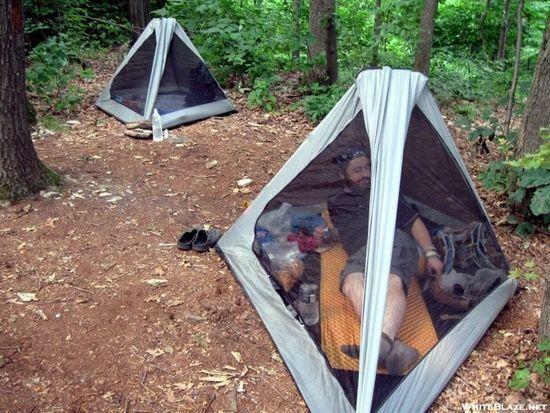 – They both appear to have the fastest, simplest solo tarptent setups on the market. – They both only require 2 stakes for the basic setup (assuming the Lightheart is in full ventilation mode). – The sides would contain stray arms and legs at night, providing a more secure feeling. Also, the floor will remain taught even when wiggling around. In the Moment, by contrast, you run the risk of slipping off your pad and onto the mesh sides, where you can expose your bag to ground moisture, let pooling water enter the floor, or even damage the mesh. The 'floating floor' is also prone to bunching up as you move about. – The side walls will protect your sleeping bag from contacting any part of the awnings, and provides added protection from heavy rain misting. It's worth noting that the person in this photo ("Ramble~On" from Whiteblaze) used the Lightheart Solo for 1900 miles of AT and preferred it over his Rainbow and Lunar Duo shelters. -Which is more wind stable? At first glance this would be the Moment, with the more taut canopy and end struts. But even if the Lightheart awning is more flappy, would the tent itself remain stable, with the head and foot stakes keeping the trekking poles securely erect? A BPL side-by-side video of these two shelters in high winds would be awesome! At this point I'm guessing the Moment is better at shedding winds, but the Lightheart is more comfortable in warmer/daytime weather. Also, the Moment appears to have a larger awning for cooking under, and a more protected entry from rain, but the Ligtheart appears to have more interior width for better interior storage. I'd love to see these tested and compared! >I personally have narrowed my next shelter down to the Moment or the LightHeart Solo. I'm at the same place you are. I'm really intrigued by this tent but the lack of real world reviews is making it hard to pull the trigger. I was having a hard time understanding how this tent could be lighter than a TT Moment, but I just noticed that her listed weight excludes stakes (4 required). Of course Henry Shires always includes stakes in his listings so you have an "all in" weight for the Moment of 28oz and the LightHeart Solo should be 28oz with stakes. Lets face it – if LightHeart had her own Franco, sales of this tent would be a heck of a lot higher. Things that I like about the Moment. 4) Did I mention the windows? It looks to me like the fly/awning is a separate piece and not actually part of the main shelter body. Is that true? I am in the same boat. I have a tarptent double rainbow and I love the quality. Moment looks good but I like the fact that the lightheart solo is a double wall shelter. I believe the awning is part of the main body that is rolled up at the apex of the tent. It's all one piece I think. > I believe the awning is part of the main body that is rolled up at the apex of the tent. It's all one piece I think. You are correct – it is 100% integrated into the main body, it looks like it is attached at the ridge-line. Not that setting up a shelter is rocket science, but it looks to me like the Moment has the edge as far as ease of setup goes. Yes and no. it is true that the Lightheart requires four stakes for the full canopy setup, and you have to set your poles the right lenght and get then in the connector tube. On the other hand, if there are mosquitos out, the the Lightheart poles can be assembled and adjusted while inside the mesh. Tarpents are no doubt fast to setup, but you do still have to unravel the pole, guide it through the sleeve, fit it into the grommets, go around to to the other grommet and erect the tent, all while outside. There are times in Oregon where the mosquitos are so bad they swarm you within seconds of stopping. One of my backpacking pet peeves is fiddling with a tent with mosquitos crawling all over me. With the lightheart, it's unravel, 2 stakes, then jump inside, zip up, and erect the poles in comfort. On the other hand, if you are in a downpour the Moment will probably be easier to set up and get in and out of without getting the entry wet. Once again it looks like the Lightheart has the edge for warm, muggy weather, and the Moment has the edge in stormworthiness. The problem with the Moment is that I'm not sure I'll be truly happy; if it is a beautiful night, I will wish I had the Lightheart, but if a storm rolls in, I'll wish I had the Scarp! I'm in the process of wrapping up the review of the Lightheart Solo. I see you all comparing it to the Moment, which is reasonable, even though the design strategy of the two tents is very different. The bottom line is that both of these are mild weather solo tents. So the comparisons should include all of the usual players from SMD, TT, GG, etc. Here are a few highlights from my time with the Lightheart Solo. 1. It's really, really, roomy inside. The headroom thing (not having headroom except the center peak area) is probably way overrated, and it's not an issue in this. 2. Condensation resistance is nil on the inner tent, obviously, so your stuff isn't going to get as wet as it will in the "hybrid" and "single wall" shelters. The only risk of your stuff getting wet is when you sleep through a clear, cold, still night, forming condensation on the inside of the fly, and then high winds come up in the morning to bang it off and send it spraying through the mesh. Compare this scenario with the Moment and you'll see the benefits of the double wall design of the Lightheart. 3. The views. Oh my goodness. The views! 4. Setup is painless, easy, and fast in high winds. 5. The tent is stable enough in really foul weather but none of these tents really have meaningful structure so worrying about how they do when the weather turns south is probably not terribly warranted. 6. I never really had an issue with the size of the Lightheart vestibule. My shoes and cooking gear and water bladder(s) went out there, the rest of the stuff I bring inside with me anyways, because I use my pack for padding and I like my gear inside so it doesn't blow around at night. 7. The *unique* advantage of the Moment is thus, probably not set up time, wind stability, weight with a pole, etc., but rather that you have the ability to open the vestibule a little when it's raining, and you really can't do that in the Lightheart. Otherwise, the Lightheart seems to offer quite a number of practical advantages over the Moment in terms of condensation management, views, and living space. 8. Did I mention the views? Mmmmmm…. Thank you so much Ryan for taking the time to write this mini-review! 1. How will it do for someone who's 6'2" and has a 77" NeoAir? 2. Can you be more specific about its performance in bad weather? 3. Can you offer any comparisons with the Big Agnes Copper Spur UL1 or UL2? 1. The big NeoAir fits in fine, which means so will you. You'll probably want to tuck the foot end of your long size bag/pad as far down into the foot end corner of the tent as you can so you sleep with a little more headroom. Unique about the fat pads is that they lift your bag up a few inches higher than thin pads so "effective" space is reduced a little and the foot of the bag will rub against the mesh. Not a big deal. It's a bigger deal at the head end, when you don't want the mesh against your face – that's why you'd tuck your bed as far down towards the foot as you can. 2. Bad weather performance. It works fine in heavy rain and the high winds a backpacker is likely to experience between Memorial Day and Labor Day in the mountains of the West. I'm not sure what else to say. All of these little tents, and most tarps of any size, do just fine. Weather performance in 3-season conditions really isn't a problem for any shelter. Add snow and it's another story, and the Lightheart isn't ideal. Too much mesh, you get a lot of wind blown spindrift in there. It's the price to pay for ventilation and views. This isn't a winter shelter. I made a video of setting up the LightHeart Gear Solo Tent last week, which I just uploaded =) It is a very nice shelter, as Ryan said – it is huge and the views are spectacular. I reckon once the Finnish Royal Airforce (aka Millions of Mosquitos) come around, this will be an excellent shelter to gain some mosquito free space to eat, relax and sleep. That is very helpful in understanding many aspect of this tent. I can see this tent would be easily modified to add a rainporch for protected entry, cooking, and views in the rain! Lynn, you do love your rainporches! Me too, I must admit. Its a big reason why I got an MLD Trailstar instead of the Duomid. The Trailstar can be pitched to you still have views when its raining. Nice video! That shelter could make quite a splash here at BPL. Lots of nice features! I love any tent that allows me to get in and out during rain without the inside of the tents getting wet. I also absolutely demand a tent that can be set up in the rain without getting the inside wet. Views while it's raining, and cooking space are just a bonus. I have been an infrequent poster on this website but have monitored it for a couple years and learned a great deal. But I guess it is time for me to come clean and introduce myself. My name is Marc Penansky. I am one of the principals of LightHeart Gear and the husband of Judy Gross, the designer and up until a few weeks ago, the manufacturer of all LightHeart Tents. Due to workload and the need for Judy to develop new products and pursue other sewing duties, we are now having the tents made for us. In fact, we have just introduced our 2 person tent, the LightHeart Duo, which can be seen on our website (www.lightheartgear.com). First of all, thank you to everyone for their nice comments about the tents and the welcome we have received on BPL. Ryan's commentary above was on a fairly early version of the LightHeart Solo and based on numerous customer comments we have made various changes and improvements to the early design. In this same vain, we are extremely interested in other suggestions that you may have for future potential modifications. @ Lynn – we are intrigued with your comment about the potential for an easy modification for a "rain porch" concept. Please email me directly: marc at lightheartgear dot com if you would be willing to share your vision. If anyone else has ideas, input, or questions please don't hesitate to forward them also. I don't profess to be the "Franco of LightHeart Gear", but maybe I can aspire to that goal and in the meantime, do a poor imitation. Please be aware that this weekend our response to emails or orders may be a little behind because we will be at Trail Days in Damascus, VA. We will get back to you as soon as we can on Monday!